Thank you for visiting my site. I hope this will give you a good introduction to me and what I do. The Oracle at http://oraclelight.com/ to learn more about The Oracle, a divine collective of energy beings helping people improve their lives and rais their energy. Kalyn has been working as a spiritual guide or coach for nearly 10 years leading workshops, journeys, classes, giving one-on-one sessions and is a published author. Kalyn herself began her spiritual path at the age of 25. Discovering a deep passion within herself to pursue her path, she has since had her spiritual and personal growth as her number one priority in life. Kalyn has worked with don Miguel Ruiz, author of the bestselling The Four Agreements, and earned a certification as a teacher of his ten years ago. She also worked with lesser known teachers, similar to Abraham, who worked one-on-one with her and with her husband Kris to help them make the most movement possible. Kalyn is accustomed to working with and in the world of energy, as she was taught. She navigates Universal Laws, including the Law of Attraction, and other significant laws such as The Laws of Self, every day in her own life and when working with students and participants. Students apprecaite working with Kalyn because they know that she genuinly cares for them and seeks to help them improve their lives, which they experience as a result of their work with her. Kalyn works with her husband, Kristopher, and together they founded The Toltec Mystery School, based on esoteric Toltec teachings and The Golden Flow(TM) system to help anyone get into their flowing state of well-being. Two of Kalyn's favorite topics are manifesting and working with women. As such, Kalyn offers a transformatie class on Manifesting and also offers women's workshops. Together they produce classes, workshops, vidoes and journeys. To contact Kalyn or Kristopher or to learn about how to work with them, you can contact them through any website, including Kalyn's blog. Kalyn specializes in assisting coaches improve their practice and has begun training coaches in the Golden Flow System™. Whether people are looking to become coaches or are looking to improve any arena of their lives Kalyn’s extensive experience, clarity and wisdom allow her to help even the most accomplished coaches. Kalyn is a Canyon-Road jewelry artist showing her work in Elysee gallery, Santa Fe. 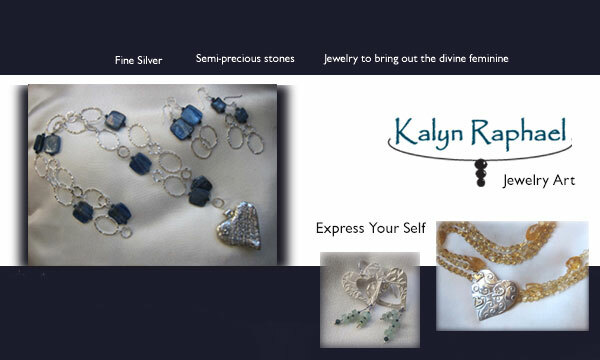 Kalyn creates unique, fine-silver pieces which she combines with semi-precious stones as well as creating beautiful pieces with raw diamonds. Seek Your Soul - a year-long journal to help you increase your connection to your Source Energy. Manifesting Abundance - A workbook walking you though universal laws to increase your ability to manifest abundance. Workbook provides lessons and excercises. Life Purpose - A workbook to help seekers find their life purpose. Workbook provides lessons and excersises.